Xing Yi Quan (Chinese: 形意拳; pinyin: Xíng Yì Quán, sometimes shortened to Xingyi). The name Xingyiquan translates approximately to "Form-Intention Fist", or "Shape-Will Fist", also called "Mind-Body Boxing" or just Yi Quan (Mind Boxing) All these names suggest a harmonious merger of thought and action. 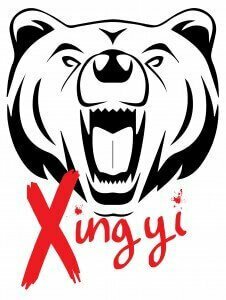 Xingyi is at first easy to learn with its seemingly limited range of movement, this art form also appears graceful yet simple, however all elements are to the contrary of the qualities that lay beneath the service, Xingyi will test even the most experienced martial artists. Hebei Xingyi is characterized by aggressive, linear movements and explosive power, it will change the way you think about martial arts. The movements found within Xingyi are concise – straight in and straight out. It utilizes calm and steady power, whereby awareness and qi are obtained. Emphasis is upon employing a foundation of single drills as the fundamental fist methods and as a means of execution. Explosive strength is employed as the core of issuing power. A practitioner of Xingyi uses coordinated movements to generate bursts of power intended to overwhelm an opponent with rapid devastating strikes. However, it is best not to forget that the tradition of a skilled master of Xingyiquan is that he could beat an opponent so skillfully as to not leave the challenger seriously injured. There something really special about Xingyi, it has just the right balance of expression of form in movement and hardlined practicality of fighting application. Xingyi teaches structure, coordination and timing very well, and there are also some great fajing (issuing power) drills that really help you get connected and use that all important 'whole body power' thing. I love the animal forms, all twelve of them are great; the hooks and defence found in Monkey, the crushing forearm and elbows of Rooster, the sheer brutality of bear... I could go on. Each animal has its innate characteristic but more important is that much of the fighting application is actually usable. If I had to choose one martial art for the rest of my life it would be Xingyi. Master Hong Yixiang said something like "hold 'Santishi' (Three Bodies Posture) for an hour a day and you'll discover how to improve your Qi", I have never tried standing for an hour a day but I did hold a lot of Santishi posture for long periods over the years and experienced some profound breakthroughs in both mind and body. The 5 Elements movements are regarded as natural and dangerous. Chopping 劈 Pī Metal Chopping forward and over, downwards like an axe. Drilling 鑽 Zhuān Water Drilling forward and upwards diagonally. Crushing 崩 Bēng Wood Striking out to the front, like an arrow. Exploding 炮 Pào Fire Exploding outward like a cannon. Crossing 橫 Héng Earth Crossing across the line of attack while turning over. Xingyiquan employs the five elemental fists, Pi (chopping), Zuan (drilling), Beng (crushing), Pao (cannon pounding), Heng (crossing) and Twelve Shape Fist as its basic fist methods. In standing, it utilizes the Three Bodies Posture, 'santishi' as its basis. Single and repetitive drill practice, as well as standing cultivation practices were transmitted by Li Luoneng to both Hebei Xingyiquan and Shanxi Xingyiquan. Xingyi honors Yuefei as the founder of its school, its origin can be traced to Ji Jike of Shanxi in the early Qing dynasty. Li Luoneng considered the essence of Xinyiquan to manifest in the mutual interchange of "External Structure" and "Internal Awareness". Having "form" and "manifestation of awareness", it was initially named, "Shape Awareness Boxing".It is said that Ji Jike created Xinyiba and was also proficient in the Liuhe Spear method. Later, he also obtained the posthumous martial-arts chronicle of Yuefei, wherein he employed the execution of the Big Spear, as fist methods and united it with his original study of Xinyiba to create this martial art. The descendants of Ji Jike are divided into various systems of Henan, Shanxi, Hebei etc, and are differentiated under various different lineages and names, including Xinyi Liuhe, Xinyiquan, Xingyiquan etc. The current, popular style of Xingyiquan is developed from Shanxi, Dai clan Xinyiquan, as modified by Li Luoneng of Shenzou, Hebei.